Let me start by explaining why this is interesting to me versus, say, using BeerAlchemy or BeerTools Pro natively on a Mac. I haven't used BeerTools Pro, but BeerAlchemy is a fantastic app and is definitely tailored to OS X and Mac users' expectations. 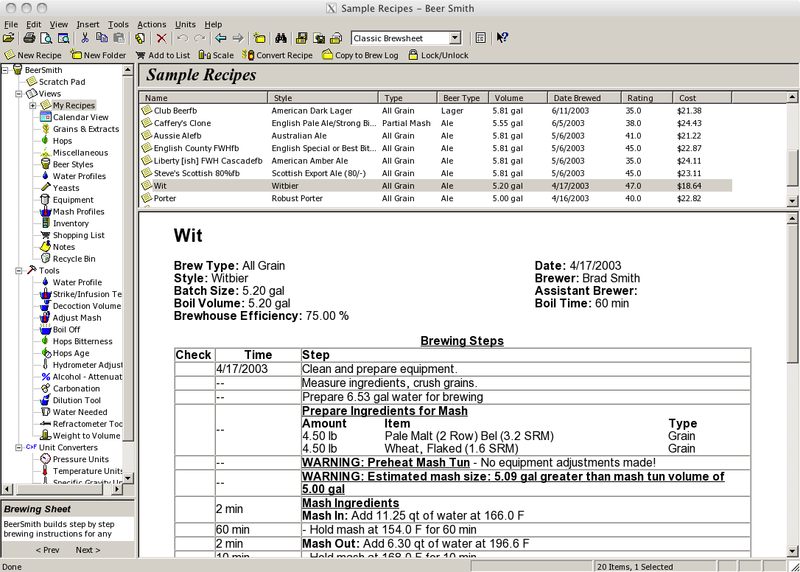 However, I've been using BeerSmith under Windows for several years and have all of my recipes, custom ingredients, brew log, etc., resident in that application. While I can export most of that into BeerXML and import it into BeerAlchemy, I also prefer BeerSmith's user interface to BeerAlchemy's, though that's probably more due to familiarity than anything else. There are also a few features missing from BeerAlchemy right now that I use heavily in BeerSmith, notably the ability to add more than one yeast strain to a recipe. I use this for the traditional purpose of a beer that's fermented with a blended yeast or with one yeast in primary and another in secondary (common with funky/sour beers), but I also use it to represent split batches where I brew double the volume and ferment half with one yeast strain and half with another. BeerSmith may not calculate values like FG properly when its support for multiple yeasts is abused in this manner, but it's a very convenient way to incorporate split batches into a single recipe. Boot Camp - With Boot Camp's dual-booting, you're either in Mac OS X or in Windows, and switching applications requires rebooting. This option provides 100% compatibility and the best performance because all resources are dedicated to the current OS, but it's also the most cumbersome if you want to switch between Mac and Windows apps frequently. Parallels Desktop or VMWare Fusion - These commercial virtual machine approaches require a full licensed version of Windows but also provide pretty much 100% compatibility because you're actually running Windows on your Mac. They also require significant resources (CPU cores, memory, hard disk space, etc.) because you're simultaneously running both OSes. Wine - Wine started as a way to run Windows applications on UNIX/Linux without requiring any license for Windows itself. It's a complete reimplementation of the core Windows services, APIs, etc. In the past several years it's reached a level of maturity that allows it to run many major Windows applications, games, etc., with few or no issues. Wine itself is completely free, though there's a commercial version with usability enhancements and customer support called CrossOver. 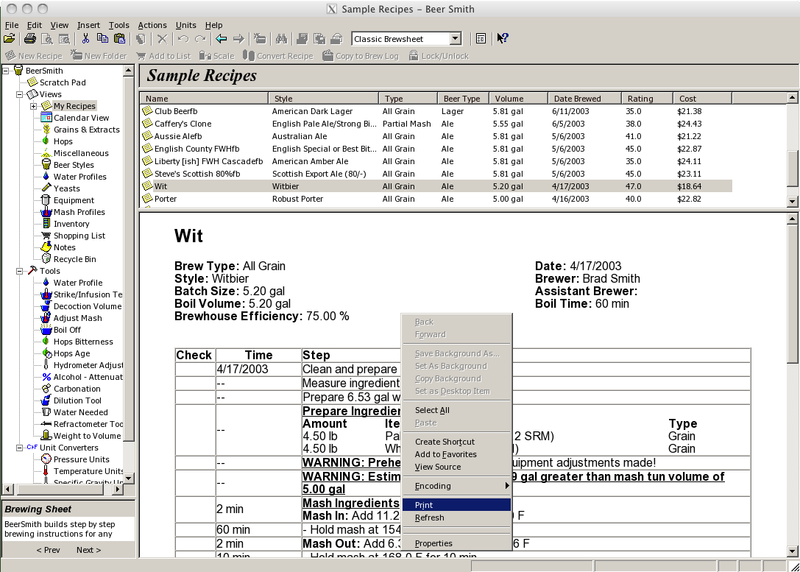 For the purposes of running BeerSmith, Wine is sufficient, but if you're interested in running more complex software such as Microsoft Office, CrossOver is a good option. Click “Install”. 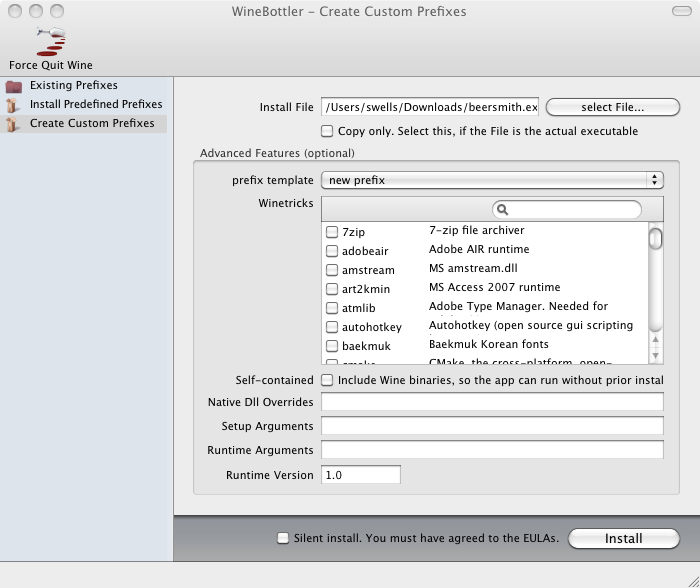 Name the new application “BeerSmith” and place it into your “Applications” folder:Click “Save” and it will install. This step will take a couple of minutes. You should see a standard Windows print dialog containing your Mac's configured printers. 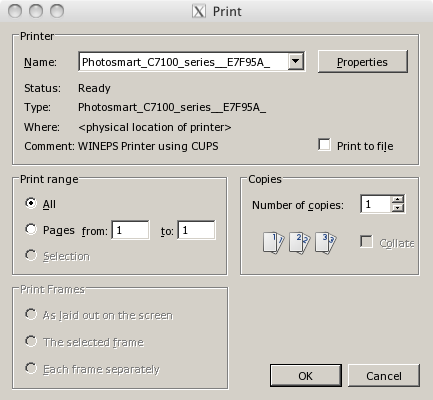 Choose a printer and click “OK”; it should print fine. You can do this from any screen in BeerSmith.